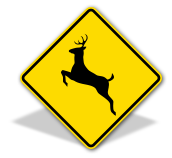 where the population of deer is active and may enter the roadway. signs can help drivers pass safely through these areas. Other bicycle-related traffic signs are no parking bike lane signs (MUTCD R7-9) and bicycle warning signs (MUTCD W11-1). There are a few MUTCD versions of pedestrian crossing signs that are posted near crosswalks and intersections. MUTCD W11-2 is used in a majority of settings, and is pictured here. MUTCD S1-1 is a pedestrian school area sign, and is posted in school zones. Both signs use a yellow-green fluorescent reflective sheeting that enhances its visibility on the roads.